The purpose of this page is to provide some guidance and tips on how to perform the above. 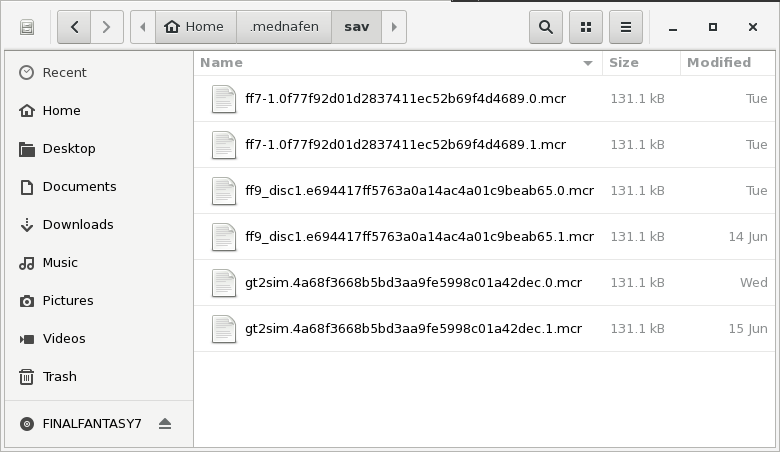 The raphnet adapter manager has a button to read the complete contents of a memory card and save it to a file. The file format is .MC or .MCR (both are equivalent and exactly 131072 bytes in size). There exist other formats (such as .GME) but these are not currently supported. In the adapter manager, press the 'Read PSX memory card' button. The adapter manager will read the memory card completely into memory. This takes less than one minute. Upon success, you will be asked where to save the file. Click on the 'Write PSX memory card' button. The adapter manager will ask that you select the source file, then it will ask that you confirm before writing to the memory card and replacing its contents completely. Interesting saves are available from sites such as gamefaqs. For instance, saves that load the game in a debug room, or saves where you have all weapons and maximum level right at the beginning, or rare items are a fun way to extend the life of a game! Such saves for the PSX appear to be more often than not distributed in .GME format which is not supported by the adapter manager at the time. But .GME files can be converted to the .MC/.MCR format easily with different tools. Here we will show how to use a program named PSX Memory Card Manager that runs unoder Linux and Windows. Download the save that interests you. 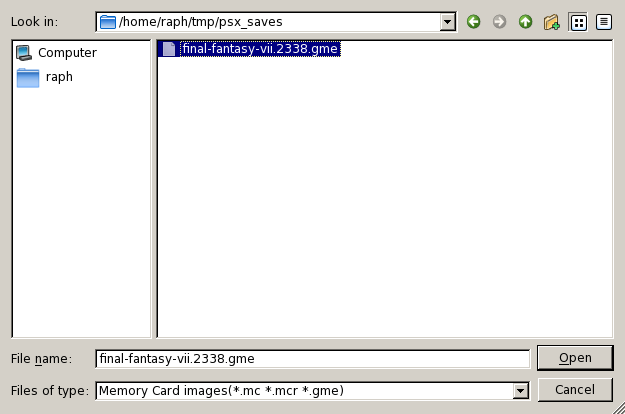 For this example, I downloaded a FF7 save by XSolaris where the game characters have a high level from this page: https://gamefaqs.gamespot.com/ps/197341-final-fantasy-vii/saves. The downloaded file in this example is final-fantasy-vii.2338.gme. From the file menu, choose 'Save Image' to save everything in .MC or .MCR format. Now using the adapter manager, overwrite your physical memory card using the file you just saved as a source. This is as described above when restoring a back-up. Open the downloaded file in PSX Memory Card Manager. Select the save, then from the file menu click on 'Save Single Game Save'. This will allow you to save a file in the .MCS format. This is a copy of the contents of a single save, not of a whole memory card. Make a backup copy of your physical memory card (i.e. Read your card using the adapter manager, saving a .MCR file). Open your card's .MCR image in PSX Memory Card Manager. 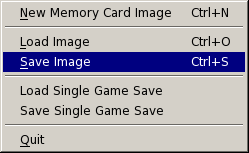 The use the 'Load Single Game Save' to insert the previously saved .MCS file. 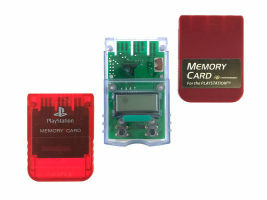 PSX Memory Card Manager will find a free block and place it there. Save the combined result in a new .MCR file. Use the adapter manager's 'Write PSX memory card' button to write the new image to your memory card. Want to continue playing a game you began on an actual PSX console, but using an emulator this time? Or the opposite? It is possible, depending on the emulator. The first part of the .MCR file names correspond to the name of the .TOC/.CUE file you use to load the game. This is how you identify which file is used for which game. Note: The .0 or .1 are there to differentiate between the first slot (0) and the second slot (1). 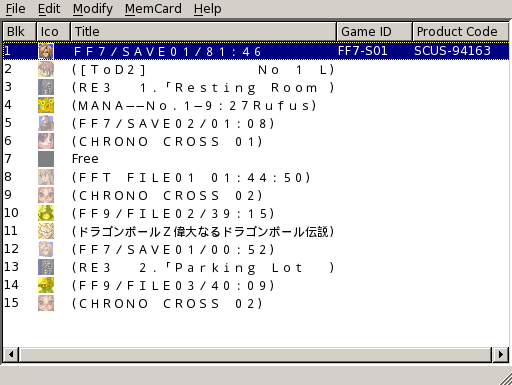 You can also use the PSX Memory Card Manager to open the .MCR file in mednafen's sav directory directly, and then insert individual saves using 'Load Single Game Save'. See previous section for more information. Hopefully this page clearly demonstrates typical use for the memory card read/write functionality offered by our PSX to USB adapter. Feel free to contact us if there are other emulators or particular use cases that are unclear or not supported yet.